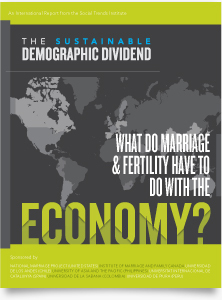 The Sustainable Demographic Dividend is sponsored by The Social Trends Institute, an international research center dedicated to the analysis of significant social trends that is based in New York, New York and Barcelona, Spain. 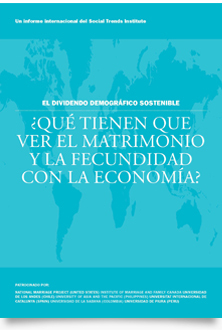 The report is co-sponsored by the National Marriage Project at the University of Virginia, the Institute of Marriage and Family Canada, Universidad de Los Andes (Chile), University of Asia and the Pacific (Philippines), Universitat Internacional Catalunya (Spain), Universidad de la Sabana (Colombia), and Universidad de Piura (Peru). The Sustainable Demographic Dividend was made possible by the editorial and financial contributions of all of the report’s sponsors. The report was also made possible by the generous financial support of The Lynde and Harry Bradley Foundation. Skip Burzumato, Eleanor Richardson, Reynaldo Rivera, Sam Richardson, and Betsy Stokes made major substantive and administrative contributions to the report. We are also grateful to InterMedia Consulting for its work in providing invaluable strategic and substantive advice in the process of preparing the report. Finally, the report’s sponsors would like to thank Brandon Wooten at CREED DESIGN for his creative work in the design and layout of the report and accompanying website.